Why are you Reviewing Me? 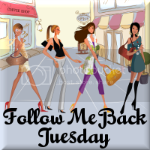 : Follow Me Back Tuesday! iii) I am making pizza for dinner. And most importantly Have Fun and Come back and see us every Tuesday ! !